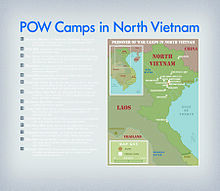 There are significant differences among POW camps, internment camps, and military prisons. Purpose built prisoner-of-war camps appeared at Norman Cross in England in 1797 and HM Prison Dartmoor, both constructed during the Napoleonic Wars, and they have been in use in all the main conflicts of the last 200 years. The main camps are used for coast guards, marines, sailors, soldiers, and more recently, airmen of an enemy power who have been captured by a belligerent power during or immediately after an armed conflict. In addition, non-combatants, such as merchant mariners and civilian aircrews, have been imprisoned in some conflicts. [ citation needed] With the adoption of the Geneva Convention on the Prisoners of War in 1929, later superseded by the Third Geneva Convention, prisoner-of-war camps have been required to be open to inspection by authorized representatives of a neutral power. Not all belligerents have consistently applied the convention in all conflicts. Before the Peace of Westphalia, enemy combatants captured by belligerent forces were usually executed, enslaved, or held for ransom. This, coupled with the relatively small size of armies, meant there was little need for any form of camp to hold prisoners of war. The Peace of Westphalia, a series of treaties signed between May and October 1648 that ended the Thirty Years' War and the Eighty Years' War, contained a provision that all prisoners should be released without ransom. This is generally considered to mark the point where captured enemy combatants would be reasonably treated before being released at the end of the conflict or under a parole not to take up arms. The practice of paroling enemy combatants had begun thousands of years earlier, at least as early as the time of Carthage  but became normal practice in Europe from 1648 onwards. The consequent increase in the number of prisoners was to lead eventually to the development of the prisoner of war camps. Overseas Bermuda Approximately 4,500 prisoners were sent to Bermuda between 28 June 1901 and 16 January 1902. The camps were situated on six islands located in the Great Sound ( Burt Island, Darrell's Island, Hawkins Island, Hinson's Island, Morgan's Island and Tucker's Island). The first international convention on prisoners of war was signed at the Hague Peace Conference of 1899. It was widened by the Hague Convention of 1907. The main combatant nations engaged in World War I abided by the convention and treatment of prisoners was generally good. The situation on the eastern front was significantly worse than the western front, with prisoners in Russia at risk from starvation and disease. In total during the war about eight million men were held in prisoner of war camps, with 2.5 million prisoners in German custody, 2.9 million held by the Russian Empire, and about 720,000 held by Britain and France. ^ Wilford, Timothy. Intelligence & National Security. Aug2012, Vol. 27 Issue 4, p 531–558. 28p. Historical Period: 1942 to 1945. doi: 10.1080/02684527.2012.688306. ^ Radford, R.A. (1945). "The Economic Organisation of a POW Camp". Economica. 12 (48): 189. doi: 10.2307/2550133. JSTOR 2550133.